Home > Study the Life Styles of Ninja, Samurai and Maiko in Japan! Study the Life Styles of Ninja, Samurai and Maiko in Japan! Ninja, Samurai, and Maiko symbolizes traditional Japanese culture in many ways. Watch and learn Ninja training, sword fighting, and traditional dances. Experiencing old time Japan is important to understand modern Japan. Who are Ninja, Samurai and Maiko? A Ninja was a covert agent or a mercenary during the 15th and 16th century in Japan. Due to the critical role to defend the feudal lords, they had expertise in weaponry, espionage, herbal medicine, disguising, and survival skills. Ninjas did many things such as espionage, sabotage, infiltration, assassination, and guerrilla warfare. Their way of moving around was deemed “dishonorable” and “beneath” the samurai caste. A so-called Ninja house was a residence for the top members of the Ninja clan. When attacked by enemies, Ninja could easily escape from the house thanks to tricks within the structure. Samurai were basically warriors commissioned to serve their feudal lords. Samurai have existed over centuries and they varied in roles and ranks in society, they had a strong sense of swordsmanship. Bushido means being loyal to their master for a lifetime. A Maiko is an apprentice to a Geiko (similar to Geisha), which is a traditional hostesses in Kyoto tea houses, where wealthy customers frequently come for the girls. The Maiko and Geiko perform traditional dances and music. It takes years to become a high-ranking Geiko but once becoming full-fledged and popular, their regular income can more than double normal salaries. 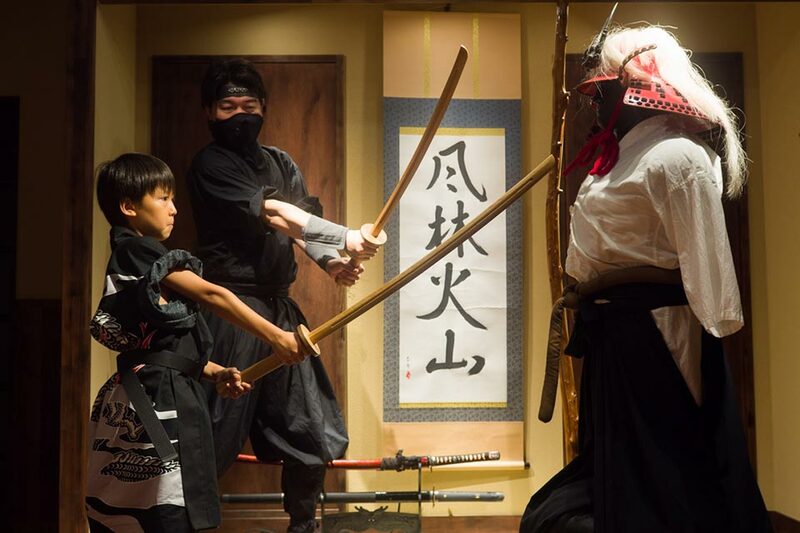 Located in Shinjuku, Ninja Trick House is the most easily accessible venue to learn and experience Ninja and Bushido culture. Throwing knifes and Japanese bamboo sword training is included in the offered activities. Since the opening in 2015, the Samurai Museum has fascinated visitors with its gorgeous collection of Samurai armor and swords dating back to 16th century. Experts sword fighters, calligraphy arts, and history about will give you a fresh perspective about Samurai culture. Guests can dress-up as samurai and take pictures together, try writing Japanese calligraphy, and learn how to handle a Japanese sword. Yumekobo is the biggest Maiko photo studio chain in Kyoto and Tokyo that has had hundreds of customers. All of the package plans at Yumekobo include dressing in a kimono, a wig, make-up, and having a photo shoot by professional photographer. The standard Maiko costs about 9,500 yen and it takes about two hours. Edo Wonderland is one of the most famous attractions in Nikko, Tochigi Prefecture. The theme park opened in 1986, this theme park offers real-life time travel to the Edo period with a close to perfect replication of an old Tokyo town from the 18th century. Wear a Kimono of your choice and wonder around the park. Renting a Kimono will make your day at Edo Wonderland even more special. The Edo period was from 1603 to 1868, when Japanese society was under the rule of the Tokugawa shogunate and the country’s 300 regional Daimyo. The period is known for economic growth, strict social rules, isolationist foreign policies, a stable population, popular enjoyment of art arts and culture, recycling of materials, and sustainable forest management. It was a sustainable and self-sufficient society that was based on the principles of complete utilization of finite resources. The period ended when the Meijo Restoration began on May 3, 1868. Gion Corner in Kyoto is a very ideal spot for busy tourists. This is a one-stop theater to enjoy a Maiko Kyomai dance and a tea ceremony demonstration. Also see Bunraku (puppet theater) performances, Gagaku (Japanese classical music), songs played on the koto, Kyogen (comic theater) and Kado (flower arrangement). A Maiko uses ornamental hairpins and other accessories, they are on display in the lobby. This Ninja house was built in the Genroku period (1688-1704) by a prominent Ninja clan as a self-defense fort. This residence is full of mechanisms that enable escape from enemy attacks such as hidden mezzanines, rope ladder halls, pitfalls, and trick windows. This Ninja house is located in Koka City, it is known as the base of Koka style, one of the most famous schools for Ninja tactics. Activities at this amusement park at guided tours, learn tricks, taste herbal tea, throw knifes, and dress as a Ninja.